High pressure along the East Coast will do what high pressure along the East Coast often does today: it will give a cold wedgie to East Alabama, resulting in a wide range in temperatures across the middle of the state today. A little light rain over North Alabama will depart this morning, but more showers will form this afternoon and rain will become likely Monday night into early Tuesday. More rain late in the week and then a really wet pattern sets up for the following week, with a chance for some wintry mischief for parts of the Southeast. 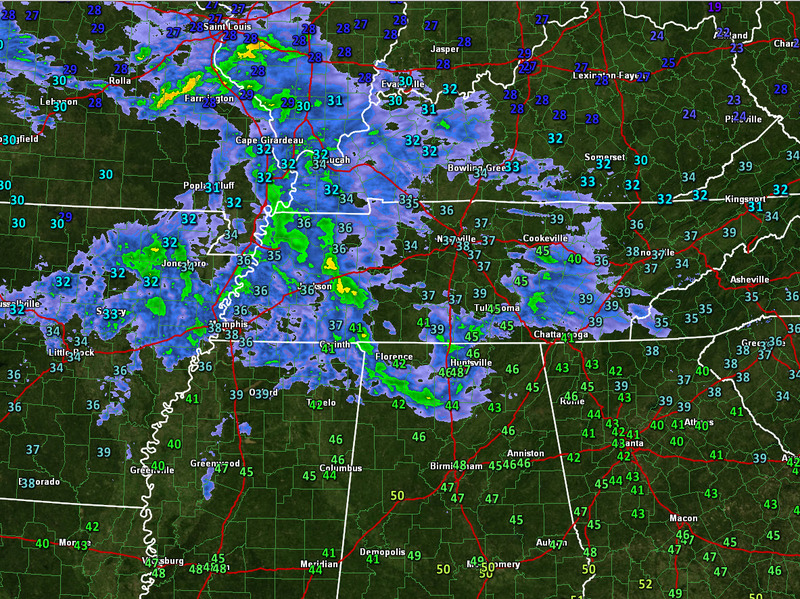 A departing disturbance is triggering showers across North Alabama this morning. To the north and northwest, winter weather advisories are in effect from Arkansas through northwestern Tennessee into western Kentucky where some icing is occurring. A few showers will show up across Central Alabama this afternoon. Highs today will be only in the 40s across East Alabama, as the wedge delivers cooler drier air in from the Atlantic Seaboard. With a little early sunshine, western counties may hit the middle and even upper 50s. The I-65 COrridor should be in the lower 50s. Tonight’s lows will be in the 40s with showers increasing. Quite the warm up Monday as southerly winds push highs into the middle and upper 60s. A few showers will accompany the warming, but the day won’t be a washout. Rain will increase Monday night ahead of a cold front. It looks like the best chance of rain and a little thunder will come after midnight Monday night. Decent rainfall amounts will fall, totaling 1-2 inches across the area by noon Tuesday. Tuesday highs in the middle 60s will actually occur just after midnight, with the mercury slowly falling during the day. Wednesday looks like a fine February day, with highs in the upper 50s. Showers begin to return to the state on Thursday ahead of our next weather maker. Rain will become likely Thursday night into Friday. There could be a little thunder mixed in, but no severe weather is expected although temperatures will be in the middle 60s by then. Things trend fair and cooler for the weekend. The GFS is hinting that we won’t get out of the 40s either day. Lows will be in the upper 20s. Arctic high pressure will settle into the Midwest, with a stubborn high pressure ridge to the southeast of us by Monday the 18th. This will set up a persistent frontal boundary over the Mid South, just to our north. We get into a wet pattern, with some interaction between the cold air and the precipitation across the northern parts of the area. This could lead to some wintry precipitation problems, especially for areas from southern Missouri and northern Arkansas into western Kentucky where a significant ice storm could be a problem. North and Central Alabama could see another 2-3 inches of rain that week. A very special WeatherBrains is planned for Monday night. The panel will be discussing women in meteorology with Ginger Zee from Good Morning America, Tina Stall from the NWS in Honolulu, and Meteorologist in Charge of the NWS Monterrey, California, Cindy Palmer. They will discuss opportunities and challenges facing women meteorologists today. Check out the show at www.WeatherBrains.com. You can also subscribe on iTunes. You can watch the show live at live.bigbrainsmedia.com You will be able to see the show on the James Spann 24×7 weather channel on cable or directly over the air on the dot 2 feed. ON THIS DATE IN 2011: Clear skies, light winds and several inches of snow cover allowed several areas across northern Oklahoma to set all-time record low temperatures. The mesonet site in Nowata, Oklahoma dropped to an amazing -31 degrees. This established a new all-time record for the state of Oklahoma. Follow my weather history tweets on Twitter. I am @wxhistorian at Twitter.com.